This is a Spiderman cake I made for my nephew’s first birthday. 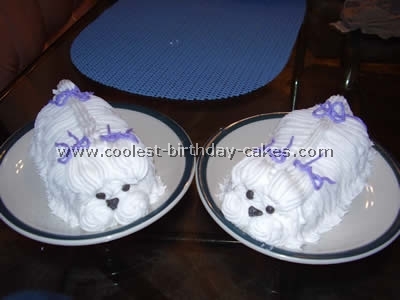 I used two 11" cake pans for the body and one 9" cake pan for the arms and cut it into four pieces. I covered it all with fondant. I made the head out of rice krispies (that was the easy part). The webbing was melting a bit on the body but otherwise it turned out great. It was supposed to look like he has muscled arms. 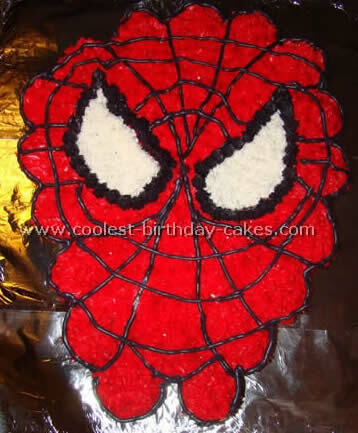 I found all the tips on how to make Spiderman birthday cakes right here on this website! I always know where to turn when I need a great idea for a cake! This is a basic white cake with custard filling. 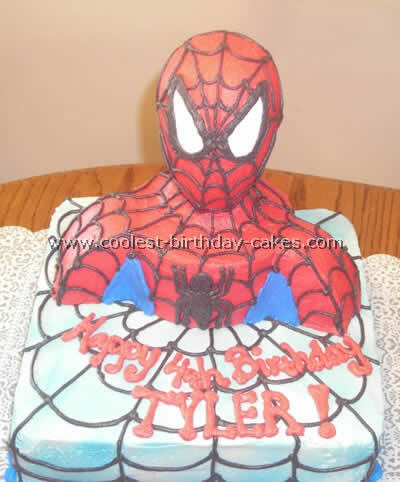 I used a fondant icing recipe from Wiltons website and checked out other Spiderman cakes on this site. 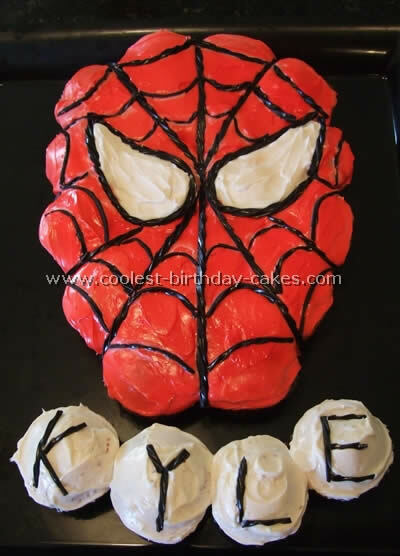 For the shape of the face I baked the cake in a metal mixing bowl and cut pieces off of it to make it the shape of Spiderman’s face. 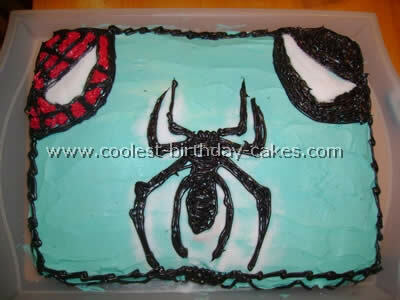 I used buttercream icing to draw the spider webs on the cake and a square cake for the background on the cake. This cake was fun and easy! It was my first try at Spiderman cakes. 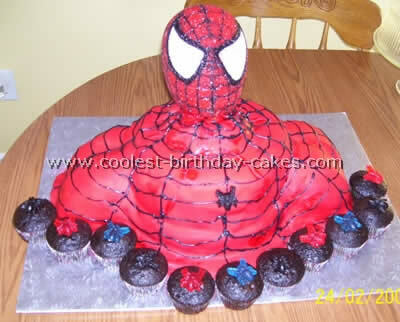 It’s actually about 18-20 cupcakes pushed together to make Spiderman’s head. Try to make gaps small as possible. I tinted one and a half cans of frosting as red as I could get with regular food coloring plus some powdered sugar to thicken. I cut the eye shape freehand and put down 1st, then frosted with red. Then sprayed top with red can spray so he wasn’t pinkish. Remove paper eyes. This left a spot for the white. We couldn’t find black shoestring licorice so my husband quartered black Twizzlers to make real skinny and pliable. It was a huge hit and one I’m most proud of! My nephew Kyle loved it. This is a Spiderman cake I made especially for my nephew’s third birthday. I used the Wilton 12" round pan and one and a half boxes of cake mix for that specific pan. After baking I leveled it off and used homemade icing (Wilton recipe) in red blue and white. I used black store bought icing instead of taking the time to make it! For the Spiderman outline I used a coloring sheet that I printed offline. I taped wax paper over the coloring sheet and then placed that combo on top of a cardboard cake board. I poked holes with a sewing pin along all the lines of Spiderman. After the initial white layer of icing had dried on the cake I took the wax paper off the coloring sheet and positioned it on the white icing. I then brushed cocoa lightly over the holes to allow the cocoa to fall through the tiny holes onto the white icing. I then carefully lifted the wax paper off the cake leaving behind the trace of the character. I used a medium tip to trace the lines and a larger tip to ice in the colors and a very small tip to make the web look fragile and thin. It was my husband’s idea to do the city in the background. 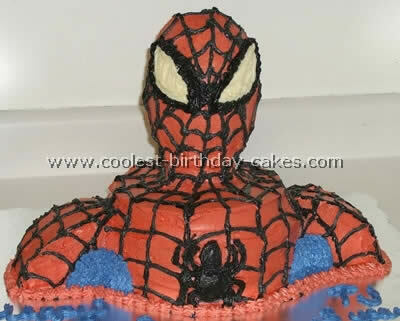 He had seen it on other Spiderman cakes. I am glad I added that, it looked much better than before! My nephew loved it! And although it was a bit tedious I had a great time making it for him! I made a chocolate cake baked in an 8 inch and 6 inch round. I also used the Wilton mini egg pan for Spiderman’s head. I decorated the Spiderman cakes with buttercream icing and used fondant accents. The bottom layer was made to look like a city. I airbrushed the web as well as Spiderman’s head. I made the webs using royal icing the day before and allowed them to dry before adding them to the cake. The name was also made out of fondant. This was such a fun cake to make! I made this Spiderman cake for my son who is turning three years old. 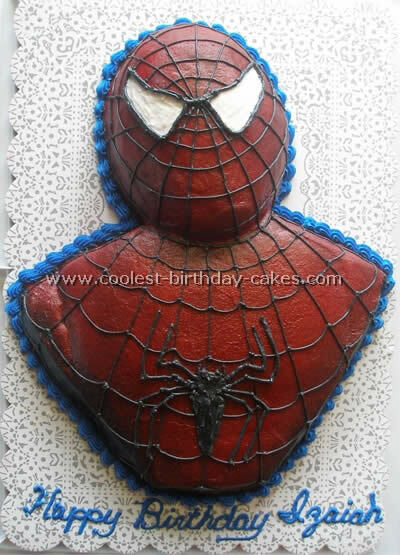 I looked around on this site at other Spiderman cakes for inspiration and was able to come up with this because of the pictures that I saw here. I made the torso out of two 9" cakes and one 8" cake stacked on top of each other. The shoulders I made from one 8" cake cut in quarters and I put two of the quarters together to form each shoulder. The head is made from rice crispie treats that I molded by hand. I used buttercream icing and just followed pictures of Spiderman for the details. For my son’s third birthday party he wanted a Spiderman cake. 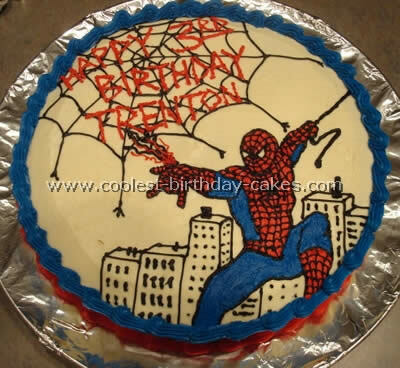 I got lots of great ideas from this site for Spiderman cakes and this is what I ended up with. It was a huge hit! I used a coloring page printed from this site as a template. 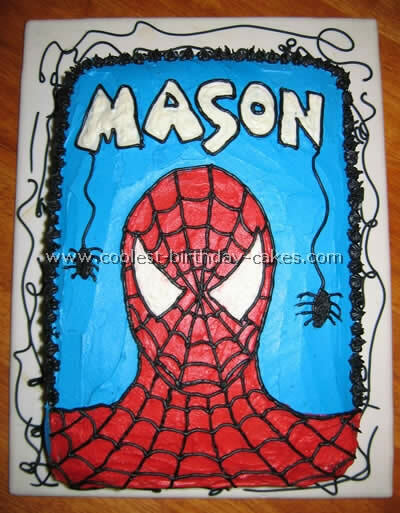 I cut out the Spiderman head and traced it (with a toothpick) onto the cake, filled in with red frosting and let it sit in the fridge for about 45 minutes. Then I added the eyes and web details with black frosting. It was time consuming (5+ hours) but relatively easy. I used a toothpick to freehand the letters and then filled in with frosting, added the spiders, piped stars around the edges and squeezed out some frosting "webs" around the base of the cake. All you need is about thirty cup cakes, a lot of red food coloring and white and black icing. You can just look at the photo and just have fun with it, your way. I did use just one cup cake with webs for the #candle. (You might not use all the cup cakes). I made this for my boyfriend’s son sixth birthday. He loves Spiderman! I baked two 12" square cakes for the base and two 6" rounds for the body and one 8" round for the shoulders. I cut the 8" round into four pieces to form the shoulders. I used a little extra cake to kind of form a neck. The head is an egg shaped Styrofoam. I put it on a wooden dowel and frosted it. The base cake I frosted white and sprayed Wilton blue color spray to make it look like sky. I decorated a web pattern on it and a border. I placed the frosted body on top and added the shoulders and neck and head and decorated it with the details. 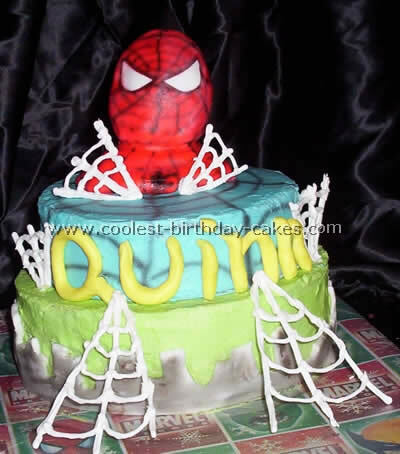 Such a fun cake to make and I have not seen any other Spiderman cakes like this on the web! This cake was for my nephew’s son’s eighth birthday. He likes Spiderman and as I was ready to embark on a new aspect of my new experience in cake decorating, the sculptured cake, I went for Spiderman cakes. I have done many layer and sheet cakes with piping figures, color flow etc. on top but have never sculpted a cake in 3D. It was a fun experience and I was quite pleased. 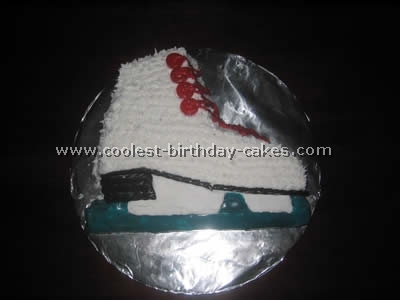 I used two 8inch long oval cake pans (Wilton) one 9 x 6inch rectangle and one 6 inch square pan (Wilton). The two ovals were stacked and shaped for the head. The 9×6 rectangle was used for the chest after cutting a relief curve to allow the chin to be below the shoulders. The two ovals were used to fill in the shoulders and abdomen below the chest. It was all covered with buttercream frosting and after allowing ten minutes or so to crust it was all smoothed out using the VIVA paper towel method. The cake was painted using an airbrush and AmeriColor’s AmeriMist Air Brush Food Colors. I used super red for the majority and navy blue for along the sides (under the arm so to speak). Before spraying the red I cut out eyes using waxed paper and stuck them down. Next time I will pipe a seal of white around the waxed paper to seal it and not allow any mist to infiltrate under the waxed paper. After spraying I used a very dark almost black piping for the webbing. Make sure your piping frosting is thin and pipe quickly as you draw the lines to help make them as straight as possible. The slower I tried to do it the more shakes got into the work. 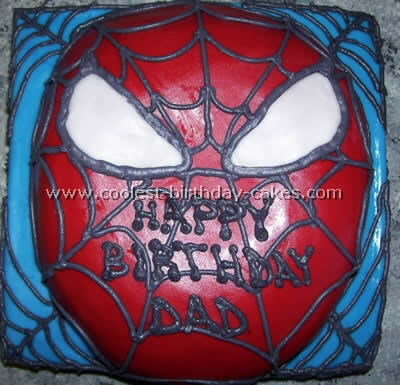 I got many ideas for Spiderman cakes from this site and just copied them onto this cake! My daughter wanted a Spiderman cake for her eighth birthday. We searched all over for cakes and I actually ended up creating my own. I found a poster online that showed the right half of Spiderman’s face on the left upper corner, and the left half of Spiderman 3’s face on the right upper corner. It was a poster advertising Spiderman 3 movie. The background was all black. Instead I wanted them to pop more and so I made the entire blue (vanilla icing with blue food coloring). I made the faces freehand with Betty Crocker icing in a can that came with four attachments – red and black. To fill in the eyes I used sugar! Then I printed out the Spiderman Spider logo and cut it out. I laid it on top of the cake and sprinkled sugar to "trace" the spider. I then filled it in with Betty Crocker black icing in a can. It was very fun to make. I used the Wilton’s Spiderman cake pan. 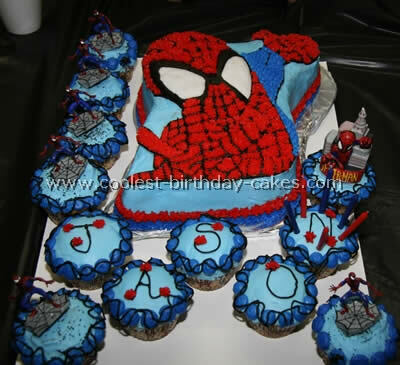 I added Spiderman cakes in a form of cupcakes, frosted in the same colors as the cake. I used Wilton spidery cake toppers and candles. The kids were so excited they mobbed the cake table! The cake is peanut, dairy and egg free. I used mixes from Cherrybrookkitchen.com.